A chair can be just a chair but sometimes a chair can really make a difference in a room. I have a signature chair in my lounge which to me really ties the whole lounge interiors together. It's black with rounded arms and is adorned with a white fluffy cushion. I found it in the street and it was the first piece of furniture that nerd boyfriend and I owned together. 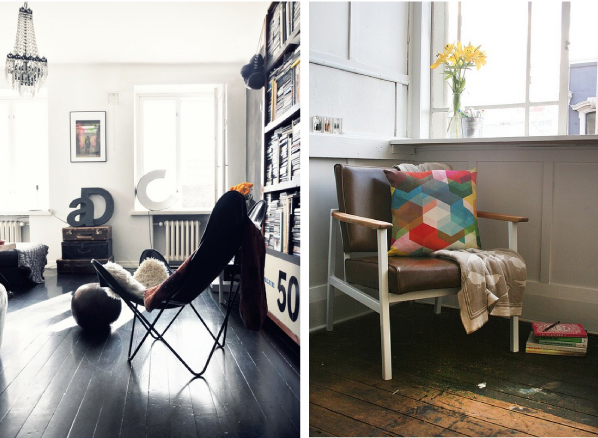 One day I'd love to own an Eames rocker like the one above and a Jardan Archie chair. But until then I'm quite happy with my off-the-street black chair. Do you have a special piece of furniture too? What would you love to own one day?